Light romance, slightly depressing topic, but an entertaining read. Keturah is a peasant girl in the snug village of Tide-By-Rood. 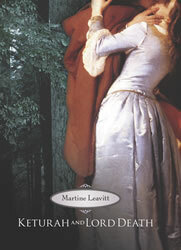 One day after following a stag into the woods she becomes lost and meets Death in the form of a young man. After she tells him the beginning of a story, Death spares her life on the condition that she return the next day to finish the tale and ultimately die. Unless she can find her true love before then. Keturah has no parents or any blood family to speak of except for her aged grandmother; their attachment seems deep in some ways but not in others: Keturah cares for her grandma enough to try and save her from a premature grave and yet she doesn't tell her of the deal she made with Death. Her two friends are supportive characters, as is the son of the village lord. Keturah has a deep love for the home she has grown up in and shows it by all the tasks of service she completes before the ending. All of the conduct throughout the book is respectful. The main character has a belief in a higher power. Some of the other characters mention Him as their basis of belief but He doesn't have an overwhelming presence in the plot, appearing more in vague mentions of the afterlife. Other than the threat of imminent Death from the antagonist of the tale there are no major sources of violence. A man pulls a knife out to attack another man, but neither of them actually fight. The mob that gathers to arrest Keturah is mentioned and briefly described. No drugs or alcohol, although they might mention once a keg of ale at a fair. Keturah is obsessed with finding her true love; granted that finding him will save her life, she does think about her possible future with the man she loves constantly. There is nothing extremely sexual in this book. Keturah kisses the same man several times and it is described; another man tries to steal a kiss from her, but Keturah runs away. On one occasion she steals the clothes from a bandit because she needs men's clothing for a task, therefore he strips naked behind a bush. No crude humor or language, with the exception of some medieval curse words. "By the beard!" is used. An interesting twist on the Sheherezade tale from The Arabian Nights, not too romantically sticky and not too dry. Keturah's village could have used more description but the author decided to make it conveniently vague to avoid historical inaccuracy. The one problem that was apparent from the beginning was Keturah's emotional inconsistency with her grandmother and the lord's son, but it doesn't detract too much from the whole of the story. This review is brought to you by I'm Only Human.